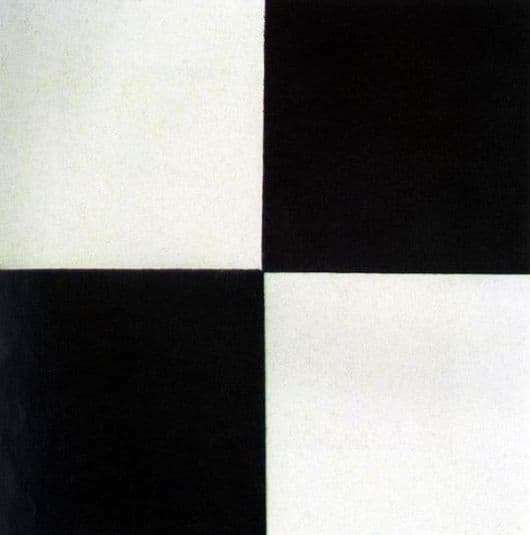 In general, a square is a part of a small triptych which included another black cross and circle. But for some reason everyone remembers the square. What did noble people see in him – philosophers, scientists, actors? What would you like to find in it or understand? Someone saw in it the future dark future, someone understood that this is our dark present, and historians almost in one voice said at one time that this is a symbol of a dark past. But let everyone remain unconvinced because no one understood the idea of ​​the artist. Black Square is infinite time in which everything is mixed and mixed up. This is the space in which life is hidden or it originated in this darkness. Who knows, maybe it all is. Malevich repeated his work several times and all four squares did not leave Russia. All are stored in different museums of the two capitals – Moscow and St. Petersburg. And invariably at this canvas, visitors stop and stare, trying to understand this secret of Malevich. But it seems it is not given to anyone, and if it is given, then this person probably will not reveal the secret. Simply then it will lose all sense to examine at the exhibition or in the museum the most strange picture of Malevich and not only him, but also of the whole world. By the way, many began to imitate him. Many artists try to draw both square and polyhedron, triangles and pyramids… to show their over-genius… and all this is in the invariably black version. So the case of Malevich is flourishing, and today it does not matter what information the canvas carries. The main thing is painfully similar.